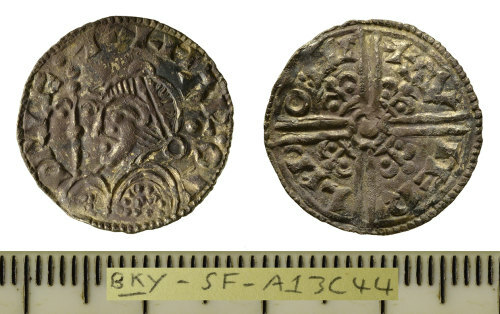 A complete silver hammered penny struck for Harold I as sole king of all England, dating to c. 1038-1040, 'fleur de lis' type. Moneyer Sumerlind/Sumerlede, mint of Lincoln. Obverse; +HAROLD RECX, diademed and cuirassed bust left, shield and sceptre in front. Reverse; +SVMERLIND ON LIN, voided long cross with pelleted centre, fleur flanked by two pellets in each angle. As North 1991, p. 131, no. 803. This coin has been recorded on the EMC as 2017.0247. Reverse description: Voided longcross quartering coin, pelleted centre. Fleur de lys flanked by two pellets in each angle. A fragment of a penny of Harold. Fleur-de-lis type, 1038-1040 (North 1980, 131, ref: 803). A silver Fleur-de-Lis penny of Harold I, sole reign, c.1038-1040 AD. As North, 1980: no. 803.